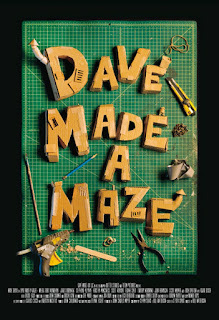 It’s rare these days to find a movie as original and imaginative as DAVE MADE A MAZE. Writer/director Bill Watterson (not the Calvin and Hobbes guy, but rather an actor and voice actor originally from Cleveland, OH) has crafted a bizarre fantasy that feels like part BEING JOHN MALKOVICH and part low budget cult horror/sci-fi fave CUBE. The premise is that Dave (Nick Thune), a thirty-something artist who seems incapable of finishing anything he starts, builds a massive box fort in the apartment he shares with his more responsible better half, Annie (Meera Rohit Kumbhani). Annie comes home from a weekend trip to discover this cardboard monstrosity, which Dave claims he has been trapped in for 3 days. He also claims he can’t find his way out. Annie is, understandably, flummoxed by this. Why not just tear the fort apart? But Dave refuses to do so, and also warns Annie against coming in after him. The fort is bigger and more dangerous on the inside than it appears. At a loss, Annie calls Dave’s friend Gordon (Adam Busch). He can’t get Dave to come out, either, and decides to call in even more reinforcements. Eventually a large group is assembled (including a few random people who just wandered in off the street), and inevitably they decide to throw caution to the wind and venture inside the fort. The box fort turns out to be a labyrinth, complete with booby traps and a minotaur. Injury and death are very real possibilities. But having quickly become lost themselves, the party must forge on, hoping to eventually find Dave, and a way out. It’s not just the film’s premise that is odd and fantastical, though. The production design is the real wonder here. My son has recently become enamored of watching youtube videos in which young adults construct sprawling, grown-up sized box forts. They’ve got nothing on Dave’s cardboard domicile, though. 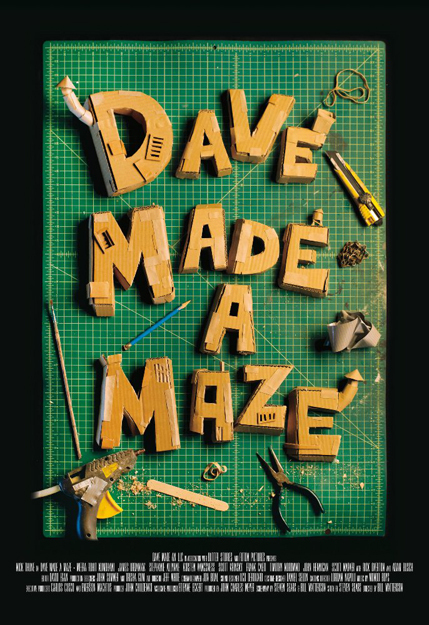 A big budget Hollywood film would probably have created Dave’s maze using mostly CGI. Watterson doesn’t have that kind of budget, though, and as is often the case, that turns out to be for the best. I’m not sure who exactly gets the lion’s share of credit for the sets, not to mention the cardboard costumes worn by some of the characters, but major kudos to the art, special effects, and set design departments. The movie is worth watching to see the world these artists have created alone. As far as themes, there’s certainly some exploration of Dave’s psychology. In particular, why he seems either unable or unwilling to finish anything he starts, or to scrap things that aren’t going well and move on. But the movie probably works best as just a straight up fantasy that incorporates a fair amount of humor, as well as some offbeat moments of horror. On the downside, even at a mere hour and twenty minutes, the film occasionally feels padded. Some of the secondary characters who venture into the box fort seem utterly superfluous, in particular Dave’s friend Leonard (Scott Krinsky), who sort of goes off by himself inside the maze to no real point besides giving the film some scenes to stretch it out to feature length. And maybe I missed something, but I really didn’t get what Watterson was going for with his ending. Nonetheless, the film is so fresh and fun that it remains enjoyable despite these issues. Fans of cult films and the offbeat should definitely give it a look. 3 out of 4 stars.